Patrizzi and Co. Auctioneers, a new auction house founded by former Antiquorum chairman Osvaldo Patrizzi, has announced its first-ever auction. The National Jeweler Network reports that the sale of watchmaking masterpieces will take place on Nov. 18 at the Hotel Richemond in Geneva, with collectors also participating via the Internet. 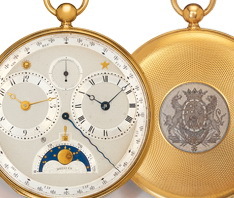 A trio of Breguet timepieces are among the lots to be auctioned off, with Breguet No. 2807, an 18-karat gold and enamel astronomical, equation-of-time pocket watch, among the offerings. The watch was one of an edition of three created by Breguet, but No. 2807 is the earliest of the three and the only one known to still be in its original condition. The watch features mean and true solar time, manual perpetual calendar and phases of the moon. The watch was sold to General Yermoloff in 1817 and is expected to sell between $1,400,000 and $1,850,000. Breguet No. 2396 is a fine and extremely rare 18-karat gold watch with a “Garde Temps” four-minute tourbillon regulator. The timepiece’s regulator features constant force escapement that has been converted, as well as independent seconds, a 36-hour power-reserve indicator and fast-frequency balance. The watch was also sold to General Yermoloff in 1815 and is expected to fetch between $550,000 and $850,000. The Breguet and Fils “Horlogers de la Marine Royal,” Breguet No. 3787, is one of three of the world’s first “Garde Temps” deck chronometers with double barrels known to have survived. Made in silver, the watch is one of the first practical deck watches ever made. It is estimated between $160,000 and $180,000. Additional highlights of the sale include a Vacheron Constantin extra flat minute repeater and a Patek Philippe Ref. 1518, each expected to realize between $180,000 and $360,000. For highlights and more information, visit the Patrizzi and Co. Web site, PatrizziAuction.com. If masterpiece watches are not your style but hip hop jewelry is, then the following article from the San Diego Luxury Pawn Shop Report is right up your alley: Hip Hop Bling Goes to Auction.